One of the ways the mold-a-rama process differs from traditional injection molding is the way the part is ejected from the mold. Usually one of the dies has a set of ejector pins that pop the part out of the mold (if you look at most plastic products you will see a series of small circular or square indentations on the back side, these are small marks left from when the ejector pin pressed the part out of the mold.) In this lego manufacturing video you can see the thin ejector pins stick out right as the part falls out of the mold at the 40sec mark. To keep the machine simple, the mold-a-rama uses no ejector pins. Instead it relies on the part staying in place while the molds open around it. This is possible because the bottom of mold-a-rama die is actually open. This is a picture of the bottom of my mold dies. The base of the plastic part sticks to the tank lid (which is why all mold-a-rama toys have some kind of flat base.) Traditional injection molding dies form a sealed cavity when they meet, save for the sprue, the opening where plastic enters the mold. Mold-a-rama dies form a complete cavity by sealing against the melt tank lid (the aluminum square below the molds, which also serves as a cover for the plastic melting tank). As you can imagine, it is very important that the dies press firmly against the melt tank lid, otherwise plastic would leak out between the dies and the tank lid. 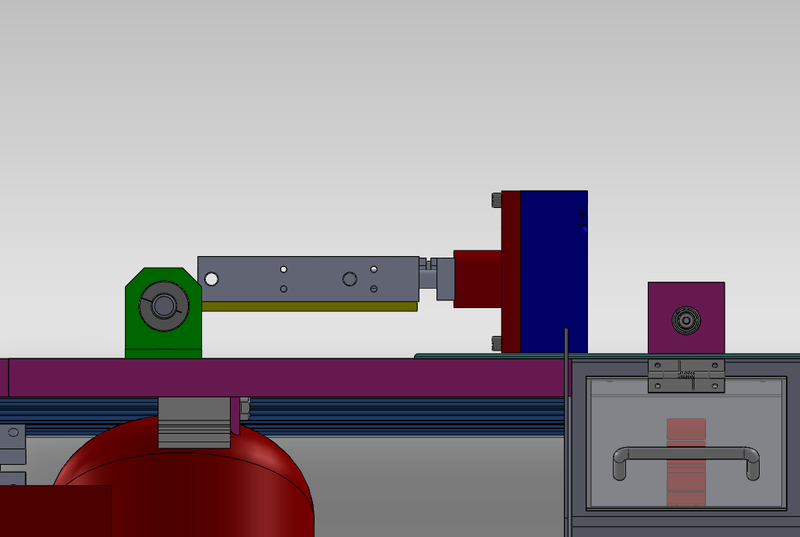 Below is a CAD screenshot of the mold cylinder assembly I originally made, the die is the blue rectangle. Can you guess if they functioned correctly? The answer is no, no they did not. When the dies closed against each other they popped up slightly, instead of being forced downward to seal against the melt tank. The can been seen in the video below. Watch towards the end and you will see the pair of molds raise up slightly. If I were to run this in an injection cycle I would have melted plastic spewing out. After some head scratching I realized I had the mold cylinders (the grey rectangular part in the CAD screen shot) placed above the pivot point (the grey circular part), this meant that when the molds pressed against each other it tended to rotate the entire mold cylinder and mold counter clockwise about the pivot point, which meant the mold moved in the upwards direction. I tested this theory by flipping the entire mold cylinder and mount upside down. Now the mold cylinder was below the pivot point, which meant the mold cylinder now tended to rotate clockwise about the pivot point, forcing the die downward. This video shows how the molds are forced downward when they meet. 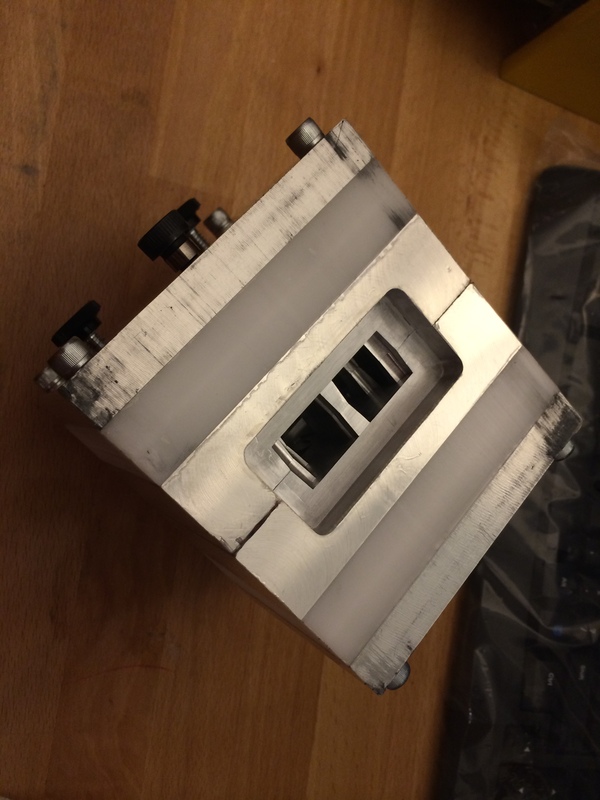 Armed with this realization, I redesigned the mold cylinder mounts to match the flipped version I had tested. With the two designs side by side (old on left, new on right) you can see how the mold cylinder location has changed relative to the pivot point. I also used this as an opportunity to to redesign the way the dies are constructed and how they interface with the mold cylinder, but that is for another post! Below are some pictures I took while machining the parts for the cylinder mounts. 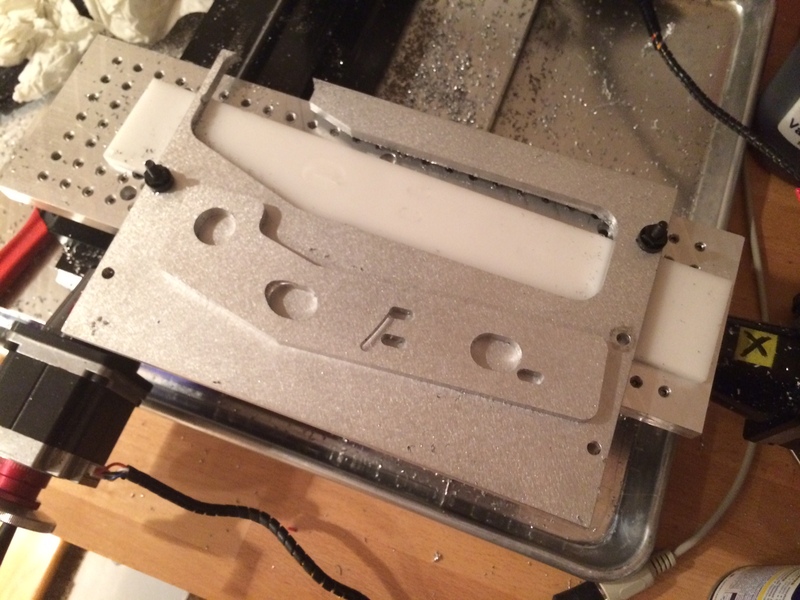 The above part was the first part I CNC cut on my mill and boy was it a learning experience. I probably scrapped 3 or 4 parts before I made the first one correctly. Between fixturing, weird g-code bugs, and getting feeds and speeds right I learned so much on that first part. The final product. The slotted screw holes allow me to fine tune the position of the die at the extended position. The bolts holding the bracket to the cylinder have serrations under the heads which bite into the aluminum. 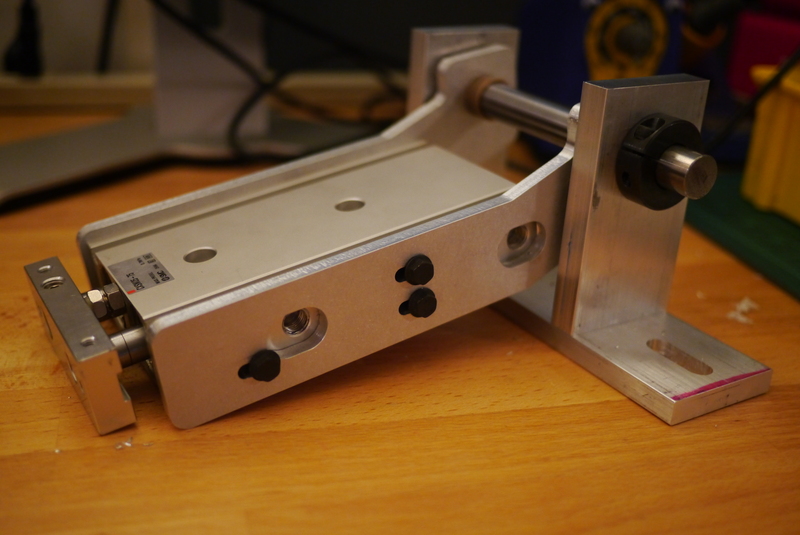 This prevents the cylinder from slipping relative to the bracket when the dies meet. The other large cutouts are clearance holes for the cylinders air fittings.